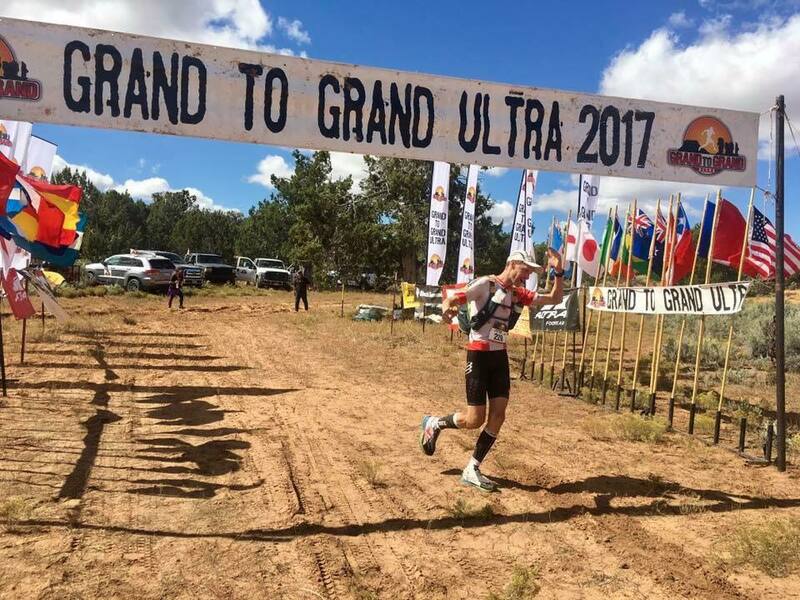 The Grand to Grand Ultra started on Saturday 23rd September on the rim of the Grand Canyon at an altitude of 5344 feet from where; over the next seven days runners would cover 170 miles (273km) in six stages. 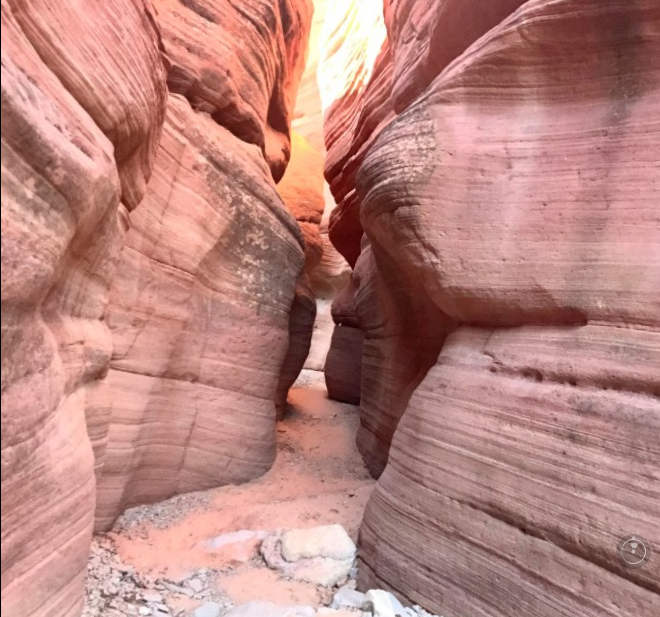 The course would lead them through a mix of terrains, including hard packed sand, soft sand, sand dunes, forest trails, red rock climbs, rocky roads and slot canyons to the eventual finish on the summit of the Pink Cliffs of the Grand Staircase at an altitude of 8698 feet. With the organisers providing only tent and water, participants had to carry all the equipment and clothing and food they needed to be self sufficient for the seven days meaning having to deal with heavy backpacks as well as the environmental conditions. 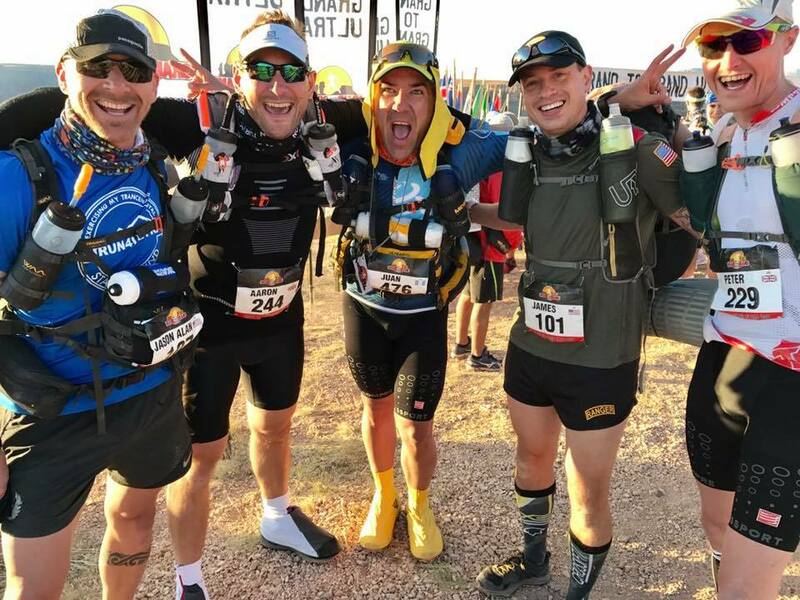 Stage one started on the rim of the Grand Canyon at 8.00am on Saturday 23rd September with the runners having to cover 30.8 miles on dry dirt trail, roads, brush and fields to their second campsite. The first stage results were to set the pattern for the event with former World Trail Champion, Erik Clavery the first to complete the stage in 4.23.50. 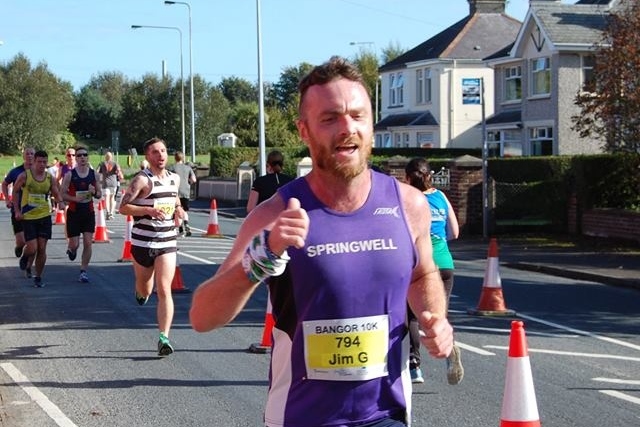 In second was Limavady man, and Springwell RC member Peter Cromie who finished in 4.44.12. Of the 119 runners who started the race 118 completed stage one. Stage 2 saw the runners gain some altitude running through the Juniper trees in the Kaibab National Forest covering the 26.9 mile stage to their third campsite. Towards the end, runners got their first taste of the ultra-soft sand that would challenge them for much of the remainder of the course. Erik was again first to finish the stage taking 4.20.16 (8.44.06) with Peter again second in a time of 4.49.27 (9.33.39). Four runners didn’t finish this stage and withdrew from the race. Stage 3 was the longest one of all with 52.6 miles of soft sand dunes and fields of prickly cactus to be negotiated while gaining over 2,500 feet. The challenge of this stage saw another 19 competitors withdrawing from the race at various points. Once again Erik led the field home with a time of 11.24.54 (20.09.00) and Peter second in 12.42.22 (22.19.31). The final runner to finish this stage did so in 29.27.21. After a day to recover, Stage 4 presented the remaining runners with 26.0 miles through Zion National Park, running the last miles of the stage through the stunning slot canyons. Erik and Peter continued their excellent performance of the earlier stages once again finishing first, 4.13.29 (24.22.29) and second 4.21.53 (26.41.24). Three more competitors failed to finish the stage leaving 92 still running. 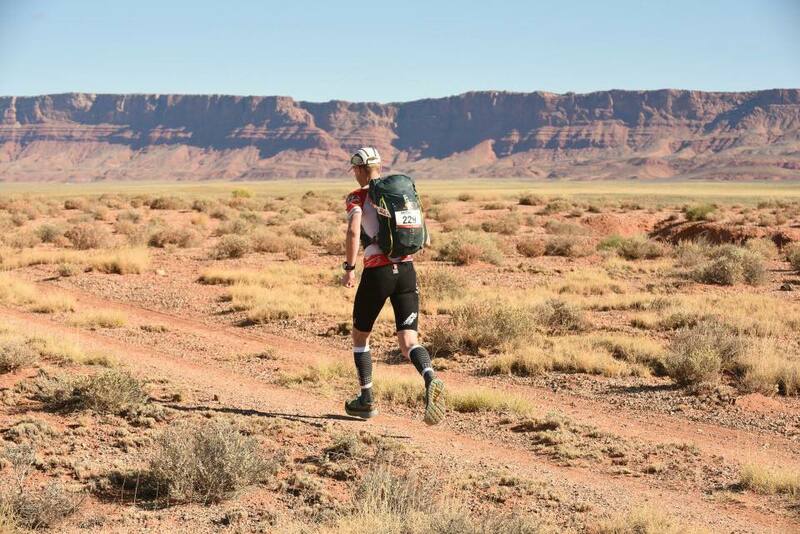 Peter Cromie during Stage 4 of the Grand to Grand Ultra. 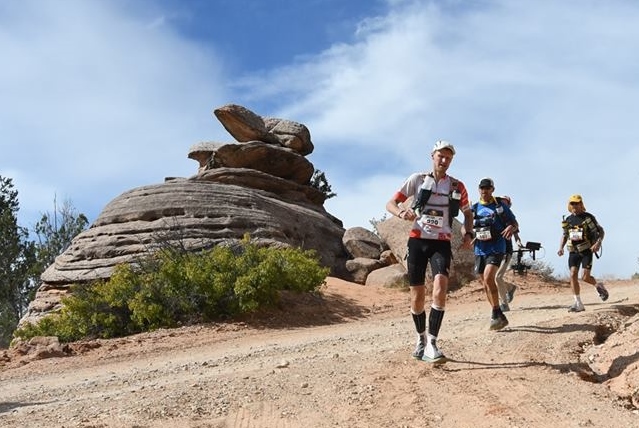 Stage 5 was another 26.0 miles with 1,400 feet of elevation gained during the stage as runners closed in on the Grand Staircase. In the already well established pattern it was Erik completing the stage first in 4.00.09 (28.22.38) with Peter second in 4.18.24 (30.59.48). All of the 92 that started the stage completed it. Stage 6 was a modest 7.7 miles, but don’t think that just because it was near the end that it was getting any easier. With over 160 miles already covered the remaining 7.7 miles were a 2,000 feet ascent on a single track road through alpine forest to the top of the Grand Staircase, with views overlooking the Pink Cliffs to provide those who finished with panoramic views of much of the course. Erik continued his dominance of the event, once again leading the field home in 1.11.40 with Peter second in 1.18.11. Once again the 92 competitors who started completed the stage. The overall positions were in no doubt, with six stage wins out of six, Erik Clavery won overall in a time of 29.34.16, similarly with six second places out of six, Peter finished second in 32.17.59. The Grand to Grand Ultra event has been described as one of the most challenging multi-stage endurance events in the world and this year’s field of competitors has consisted of former World Trial Champions, Ironman Champions and other World Class Endurance athletes. Peter Cromie has been competing at the very highest level and his result deserves the highest praise. The Limavady Sports Council Awards took place on Friday 29th September at the Limavady Recreation Club. All the hard work by Springwell RC, that meant that this year’s Jude Gallagher Memorial Round the Bridges Race, was one of the most successful in recent years was recognised when the event won the ‘event of the year’ category. Race Director, Thomas Moore, whose coordination of the event was instrumental in making it the success that it was, won the ‘administrator of the year’. Thomas’s will now represent Limavady in the administrator of the year category at the Causeway Coast and Glens awards evening. On Saturday 30th September, Gideon Kipsang (Derry Track Club) and Laura Graham (Mourne Runners) claimed top honours as over one thousand competitors took to the streets of Bangor for the annual Bangor Classic 10k road race, hosted by North Down AC in association with Belfast City Airport. The course took competitors from Castle Park, through the atmospheric Town Centre and onto the picturesque North Down coastline, where they negotiated a flat but harsh promenade section before turning and making their way back towards the town and the well-supported finish area in Ward Park. On Saturday 30th September, Mourne Runners hosted the final race of the Northern Ireland Mountain Running Association (NIMRA) Championships, and the penultimate race of the mountain running season, the Commedagh Chase. The event, in the Mourne Mountains, covered a 13k course starting and finishing on the Trassey Track. The runners initially made their way towards Hare’s Gap, from where they took the ridge to the top of Commedagh, which included Slievenaglogh and Slieve Corragh. At the top of Commedagh, the runners retraced their steps along the ridge over Slieve Corragh and Slievenaglogh. On the return route, the course did not go towards Hare’s Gap but instead, took the stile halfway down Slievenaglogh and from there it was a straight out downhill sprint to the finish at the bottom of the Trassey Track. In the men’s Newcastle AC club mates Ian Bailey and Seamus Lynch went head to head in a race that was to produce a new course record with Ian the eventual winner in 57.46 and Seamus second, finishing in 58.22. Timothy Johnston (Mourne Runners) completed the podium in a time of 1.02.32. Shileen O’Kane (Lagan Valley AC) had to fight hard for the win with Martsje Hell (North Belfast Harriers) challenging for most of the race. The Lagan Valley runner moved clear on the descent off Commedagh and rapidly extended her lead on the race downhill to the finish line, winning in a time of 1.15.36. Martsje secured second in 1.20.03, with Bethany Haugh (Mourne Runners) completing the top three in 1.20.28. The inaugural East Donegal Half Marathon, in association with Excel Sports, started at 9.00am on Sunday 1st October with over 250 runners taking part. The route started and ended at the beautiful gardens at Oakfield Park, Raphoe. The first across the finish line was Olympian Caitriona Jennings with a time of 1.18.15, followed by Paddy Ryan (Milford AC) in 1.18. 39 seconds. Springwell RC had two members at the race with Will Colvin 104th in 1.51.43 and Steven Miles 228th in 2.18.17. 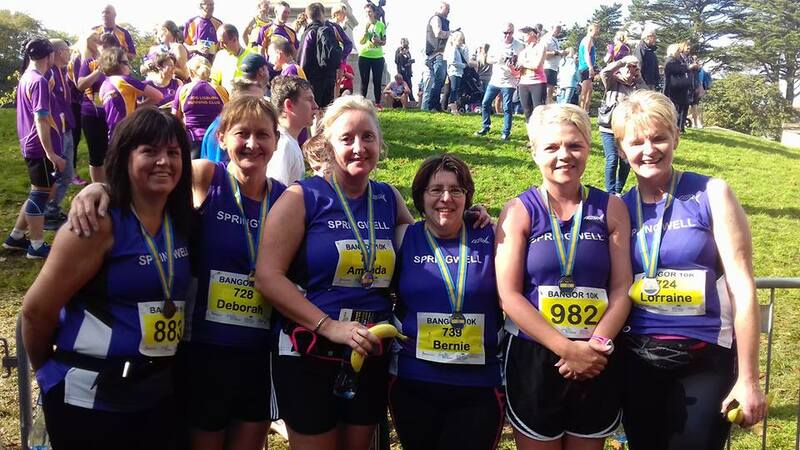 56 Springwell RC members were out park running in 11 different venues with 7 recording personal bests.